What’s the best food to feed your ferret? This is a difficult question to answer and one that has caused a lot of debate among ferret lovers. 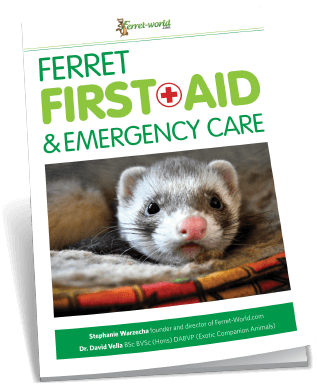 In this page, we’ll tell you the basics of what ferrets need, the benefits and risks of a kibble diet vs. a raw meat-based diet, and how to pick the best food for your ferret. What does my ferret need to eat? Ferrets are obligate carnivores, so their diet needs to be primarily meat-based. They do not have the enzymes in their stomachs needed to digest plant matter. 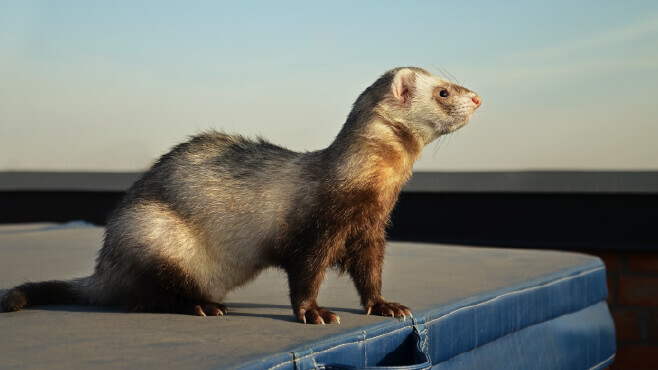 In addition, ferrets need a lot of protein and fat, and very little fiber and carbohydrates, to stay healthy. Because they cannot digest plant matter well, the protein and fat must come from meat-based sources. Ferrets also need a 1:1 balance of calcium and phosphorus. Calcium is found in bones and phosphorus in tissue meats. Most commercial kibbles have an appropriate calcium to phosphorus ratio. 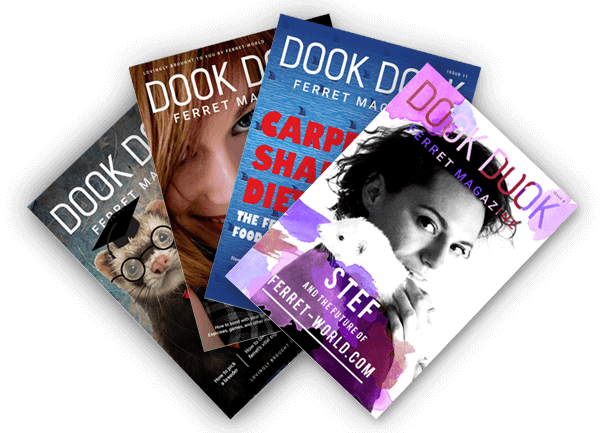 Should I feed my ferret a raw meat-based diet or a kibble diet? The short answer is that we don’t know. There have not been any studies that have looked at ferret health or lifespan when fed a raw meat-based diet or a kibble diet. There’s actually been very little research done on ferret diets at all. Greater digestibility. 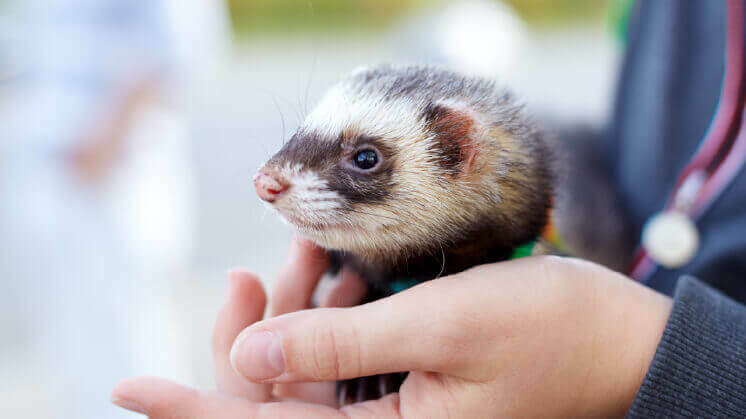 Ferrets have a very short digestive tract, so their bodies are unable to absorb as many nutrients from their food as other carnivores like cats. Meat diets are easier on their digestive system, ensuring that ferrets can digest enough nutrients to stay healthy. Higher protein and fat. 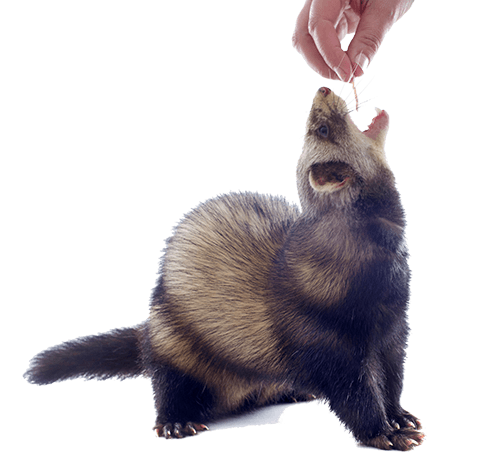 Raw meat-based diets contain high levels of both meat-based protein and fat, both essential elements of a healthy ferret diet. Lower carbohydrates and fiber. Raw meat-based diets contain no or very little carbohydrates and fiber, both of which ferrets have difficulty digesting. Ferrets diets with high carbohydrates and less protein can cause poor breeding, poor health, and a greater susceptibility to disease. Better dental health. Kibble diets can lead to a buildup of plaque and a loss of tooth tissue. Because ferret teeth have evolved to eat raw prey, raw meat-based diets don’t typically cause the same issues. Pathogen risk. Despite the benefits of a raw meat-based diet, many vets and veterinary organizations are anti-raw diets. This is mainly because of the risk of spreading dangerous bacteria from raw food to yourself, other humans, and your pet. While many people believe that obligate carnivores like ferrets are better equipped to resist bacterial pathogens, we haven’t been able to find any evidence that they are able to resist pathogens specific to processed foods, like Listeria monocytogenes. Additionally, the humans handling the food are certainly not resistant to these bacteria. Any raw meat, no matter how safely processed and packaged, has a risk of carrying dangerous bacteria or parasites. 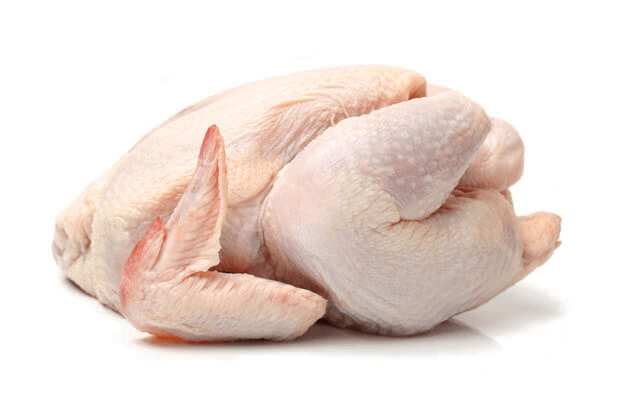 Freezing meat does not kill these pathogens; that can only be done by cooking, pasteurizing, or irradiating the meat. Cooked and pasteurized meat are inappropriate for ferrets. Poor nutritional balance. The consensus among vets in the 2017 British Veterinary Nursing Association (BVNA) congress was “that homemade raw feeding is dangerous because it is so difficult to get it right in terms of nutrients and balance.” Studies looking at recipes for raw meat-based diets for dogs and cats found that very few of readily-available recipes provided an appropriate balance of nutrients. Unfortunately, most ferret owners focus on the macronutrients required by ferrets (protein, fat, and carbohydrates), but the larger danger with raw meat-based diets is an imbalance of micronutrients (vitamins and minerals). 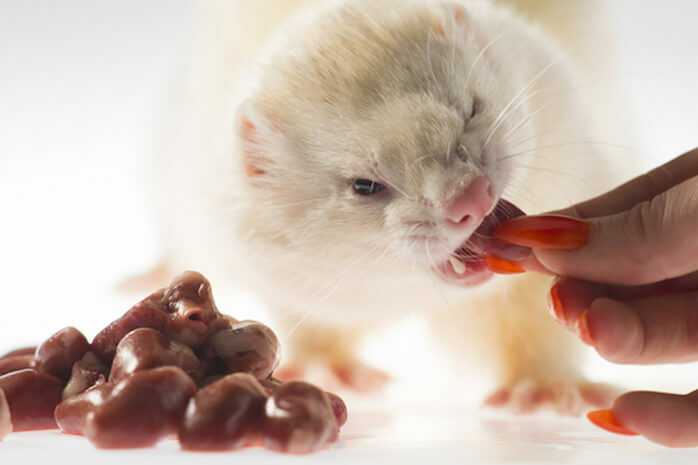 In short, while the nutritional requirements of ferrets can be met with a raw meat-based diet, it’s very difficult for owners to get right. 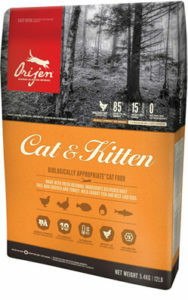 Supplement with chicken necks and wings, as well as whole prey (unbutchered rabbits, chickens, and ducks). Appropriate balance of vitamins and minerals. Even low-quality ferret and cat foods typically have a good balance of the micronutrients ferrets need, like thiamin, riboflavin, niacin, biotin, and calcium. This doesn’t mean just any kibble is good for your ferret! They need much more than just the micronutrients. It just means that, unlike raw feeders, kibble feeders can focus only on the quality and amount of protein, fat, and carbohydrates. Very low risk of pathogens. While there have been high-profile cases of dry pet food recalls, like the melamine-tainted pet food scandal in 2007, the vast majority of food recalls over the past ten years have involved wet or raw foods, not kibble. Dry foods are cooked (either baked or extruded), which kills the kind of dangerous bacteria and parasites that can be found in RMBDs. Unlike with raw foods, it’s safe if your ferret stashes kibble somewhere secret for later. High carbohydrates. 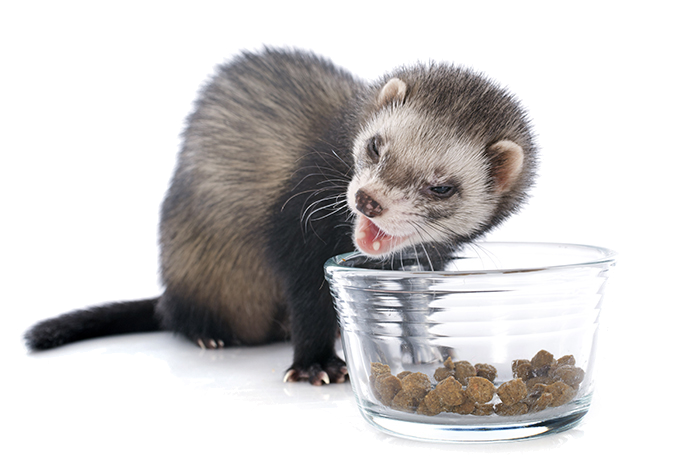 Most ferret and cat foods contain much higher levels of carbohydrates than are good for ferrets. Vegetable protein. Many, but not all, ferret and cat foods inflate their protein levels with vegetable proteins. 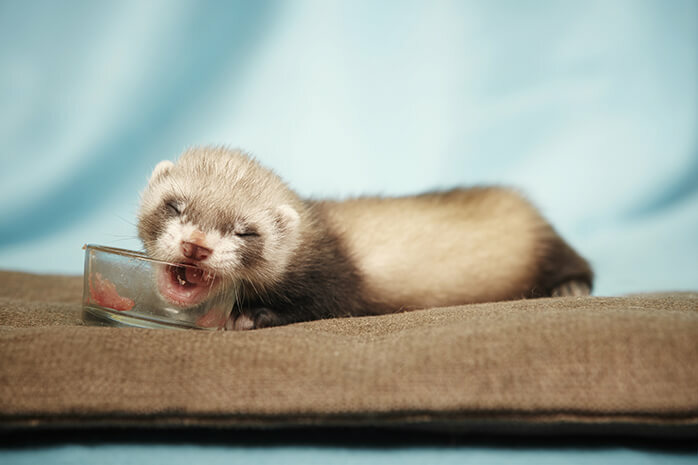 Because ferrets cannot properly digest plant matter, they cannot metabolize vegetable protein. Ferrets need protein from high-quality, meat-based sources. Poor dental health. Kibble diets can lead to a buildup of plaque and a loss of tooth tissue. When evaluating a ferret or high-quality cat food, use the guidelines below to evaluate the packaging’s list of ingredients and guaranteed analysis. (If you live in a country that doesn’t require this information to be on the packaging, consider importing your kibble from a country that does.) We recommend that you do not rely solely on other people’s recommendations, even ours! You should always check the labels yourself. In most countries, this list must be ordered from the highest concentration to the lowest concentration. Thus, there is more of the first ingredient in the food than there is of the second ingredient. In kibble, this usually means any ingredients beyond the first 5 are only included in very small amounts (less than 5%). A guaranteed analysis must list certain macronutrients, such as protein and fat. However, it does not have to tell you the source of those nutrients. A food may say it has 50% protein, but if most of it comes from vegetables, your ferret will not be able to digest the protein. This is why you must check both the ingredient list and the guaranteed analysis. Like with a raw meat-based diet, variety may be required to meet your ferret’s needs. 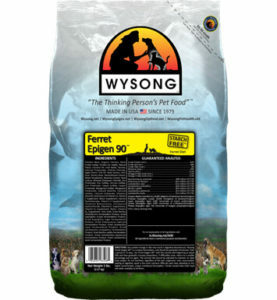 For example, a commonly recommended food is Wysong Ferret Epigen 90. While this food has good ingredients and plenty of protein, it only has 18% crude fat, meaning it should be supplemented with a food that has a higher fat content, but can have less than an ideal protein content. 6“Named” means that the label specifies what kind of meat is included, e.g. beef, chicken, pork, or fish.